As part of the City of Fremantle’s new ‘Renew Fremantle’ initiative (http://cofremantle.wordpress.com/2010/12/15/renew-fremantle-first-shop-open/), a group of 12 local handmade designers have joined together to create the latest ‘pop up shop’ in Adelaide Street called “Montage” opening Tuesday 8th February 2011. The initiative sees the City of Fremantle providing vacant retail spaces, rent-free, for local artists to showcase their talents with the aim of invigorating and revitalising otherwise ‘dead areas’ of the city. The shop will showcase an array of handmade designs including jewellery, art, accessories, stationery and homewares. 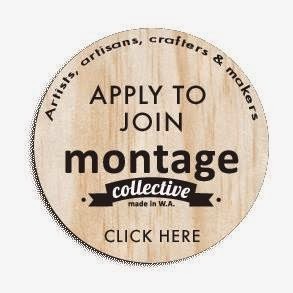 Montage will be open from the 8th to 25th of February at 4/64 Adelaide St, Fremantle. We will be trading 10am – 5pm, 7 days a week. For further information, please do not hesitate to us.